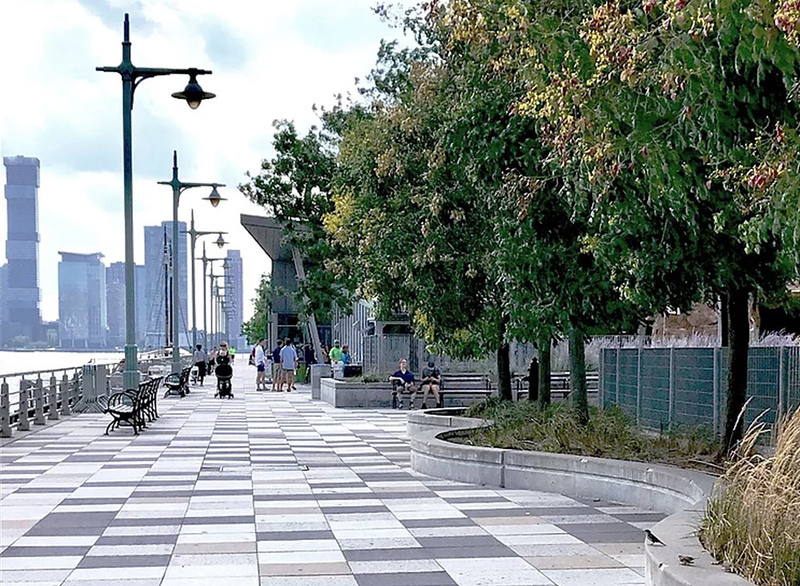 You don't need Brad Pitt to make this river shine: South Florida urban planner Melissa Hege takes a tour of New York's Hudson River Park, 4-miles of waterfront park perfection. 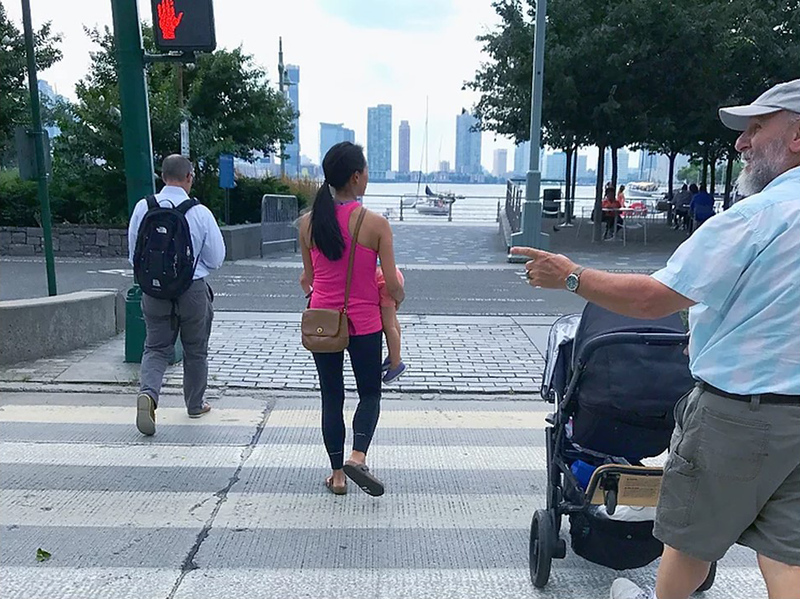 Last summer, amidst the noise of construction, car traffic and people, my little one and I were in search of Hudson River Park. We loved the Highline for its imagination and unexpectedness, but Hudson River Park is so much more. I knew I’d find it if I kept heading west. After all, Hudson River Park was the case study for our Baywalk pop-up, now under construction in Miami. The park didn’t just happen overnight. 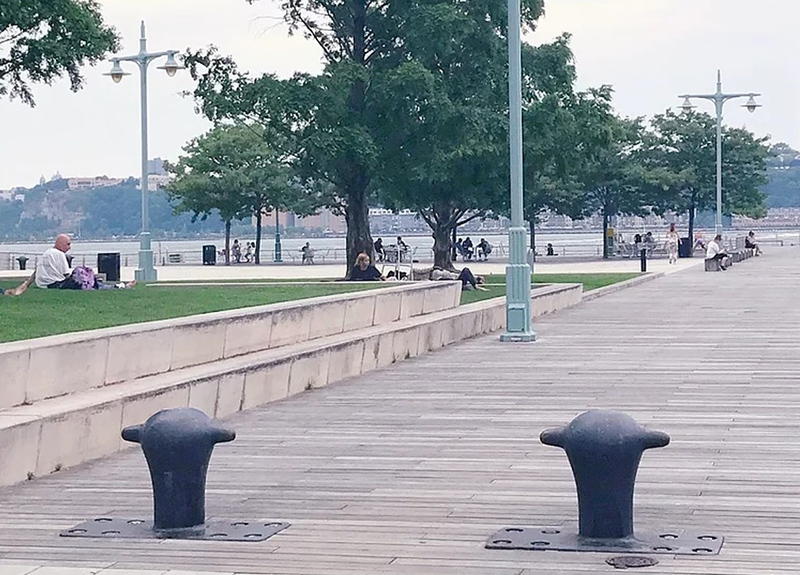 Hudson River Park was created twenty years ago through New York state’s Hudson River Park Act. 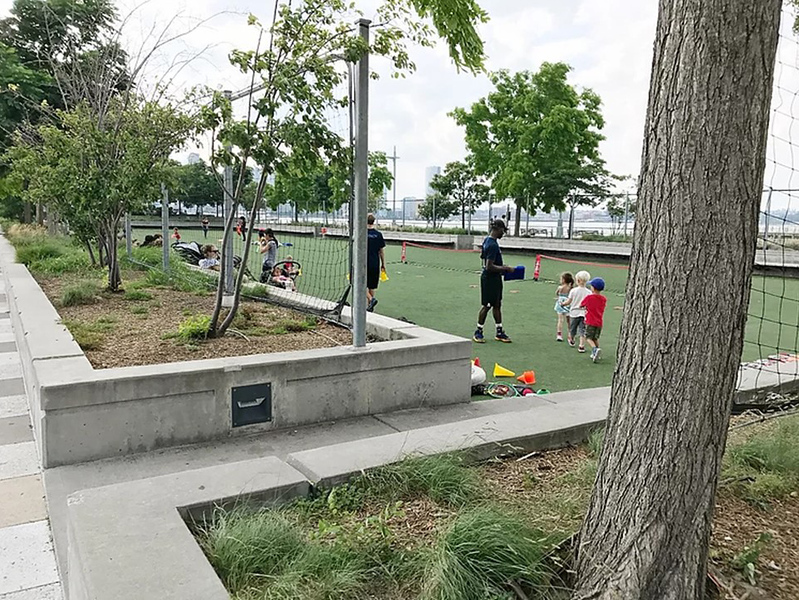 The Act established an official Hudson River Park Trust to plan, design, construct and, ultimately, manage and operate the park. It also created an advisory board to oversee park planning, and established a funding source. The lesson for Miami: in order to have a great waterfront park on the Baywalk, we need a management structure. 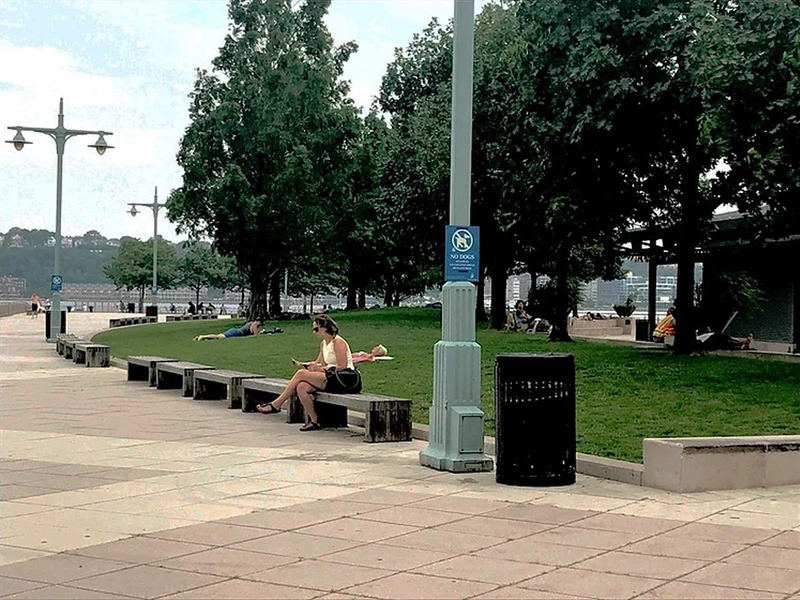 Hudson River Park’s official management entity provides a perfect case study. En route to the park last summer was this leafy, tree lined street with super wide sidewalk, a simple pavement pattern. A short wall does double duty by separating the front entrance of the private building from the public sidewalk and creating a nice little area for siting and some small plantings. In urban planning terms, these distinct areas are “zones”. A lot of thought was put into this particular design; sidewalk pavement changes depending on the zone. It’s subtle, but very effective. And here we are: one of the many entrances to Hudson River Park. The first thing in my sight line was the water and the skyline. This is critical. 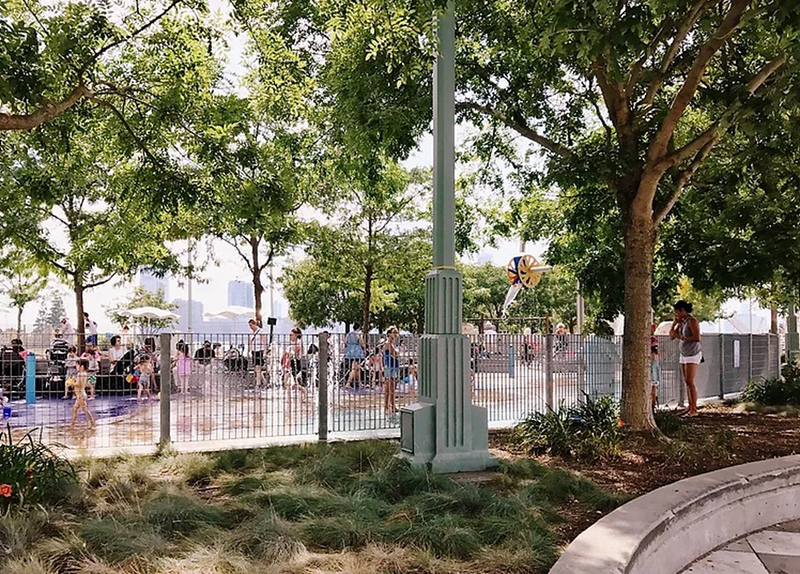 The water is what draws you in and it’s the entire point of the park. Marked bike lanes- how cool is this! Here’s another view of the same crossing. A little more detail shows how rich and complex the crossing really is. Car traffic, sidewalk and protected bike path. I absolutely love this. The two way bike path is wide, shaded and, best of all, perfectly safe. 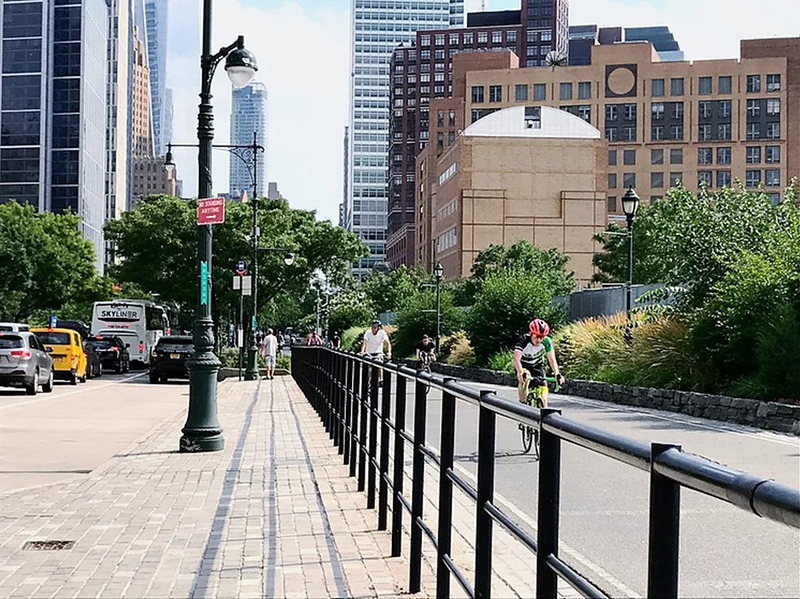 The metal railing prevents people from unknowingly walking from the sidewalk into the average cyclists clipping along at high speeds. The lush green plantings provide additional separation park-side, but is also really beautiful to look at. And the path is lined with lamp posts for lighting at night. 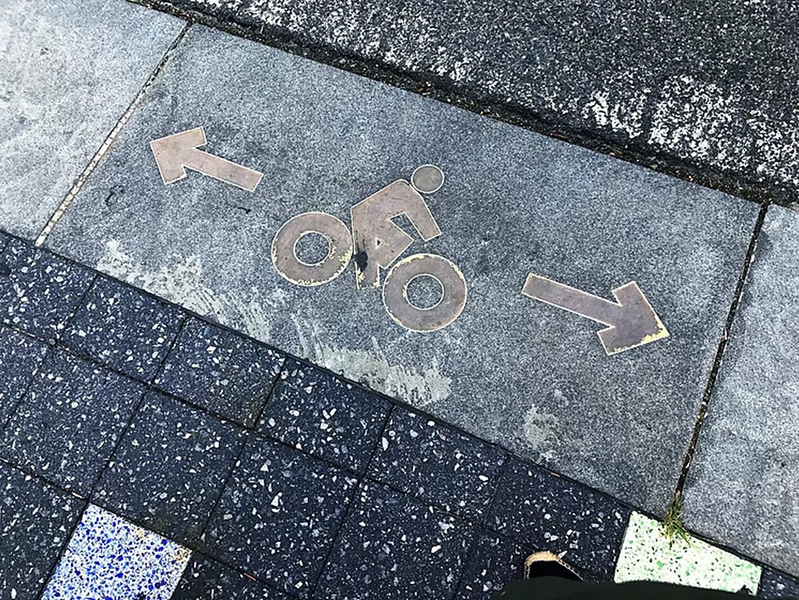 And in case you might have been looking down at your cell phone and didn’t see the bicycles whizzing by, the City embedded this nifty metal bicycle symbol into the edge of the granite paving in advance of the bike path crossing. I like it because it’s both elegant and perfectly clear. 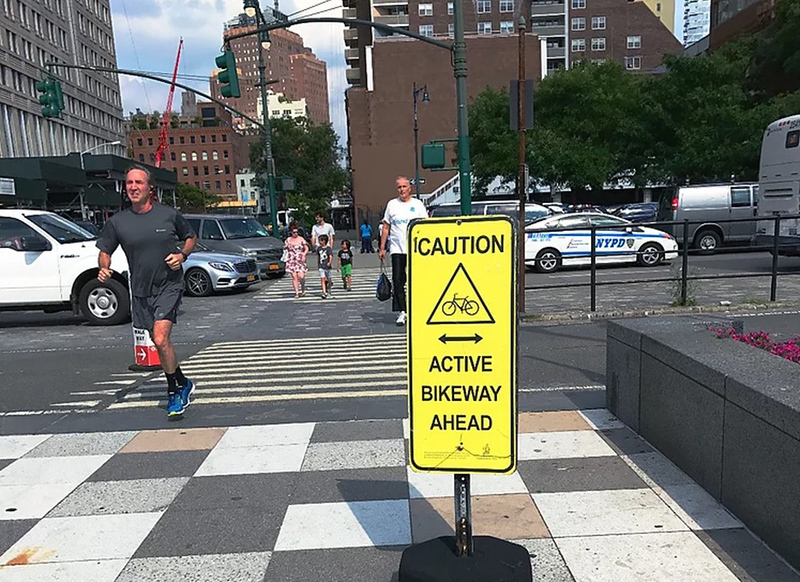 And from the park side, here’s another reminder of the active bikeway ahead. 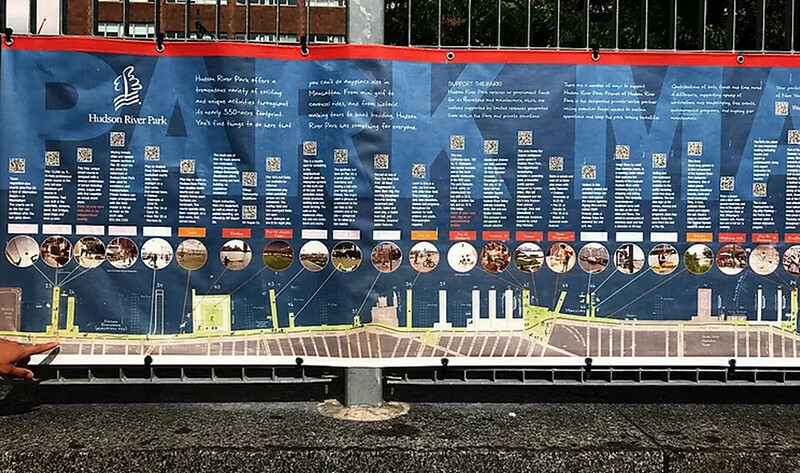 A simple canvas sign attached to fencing with grommets and plastic ties provides a map of the park with key points of interest. It doesn’t have to be fancy or even permanent. It just needs to be clear and easy to use. Because this is a 4-mile park, there is an entrance at every adjacent street, so each one is a little different. I like this one because it transported me to a European plaza. This could be Paris. 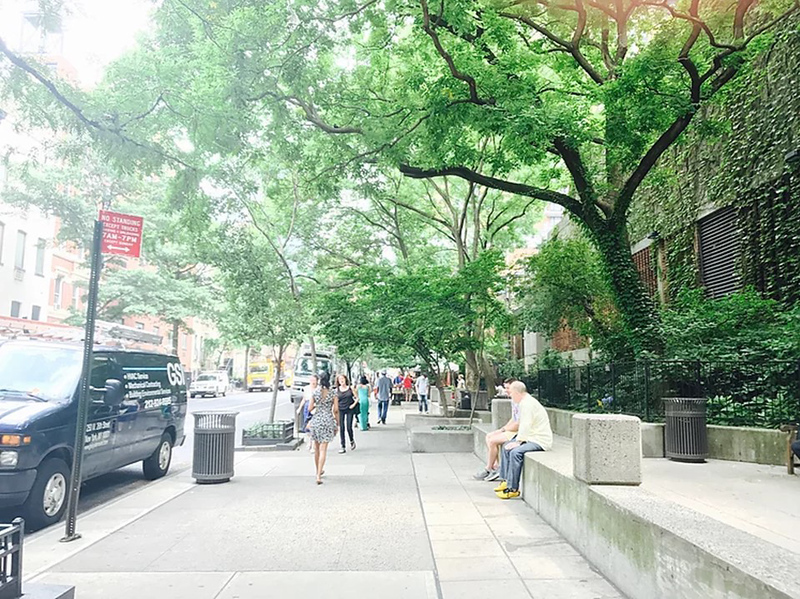 The full green trees on the edge of a stark and warm plaza. The overhead lights hanging from metal string, and the fountains peaking from behind. The fountain is just one of hundreds of programmed spaces in the park. If you look past the tacky yellow chain and baluster, you can see the jets of water springing up from the flat pavers. 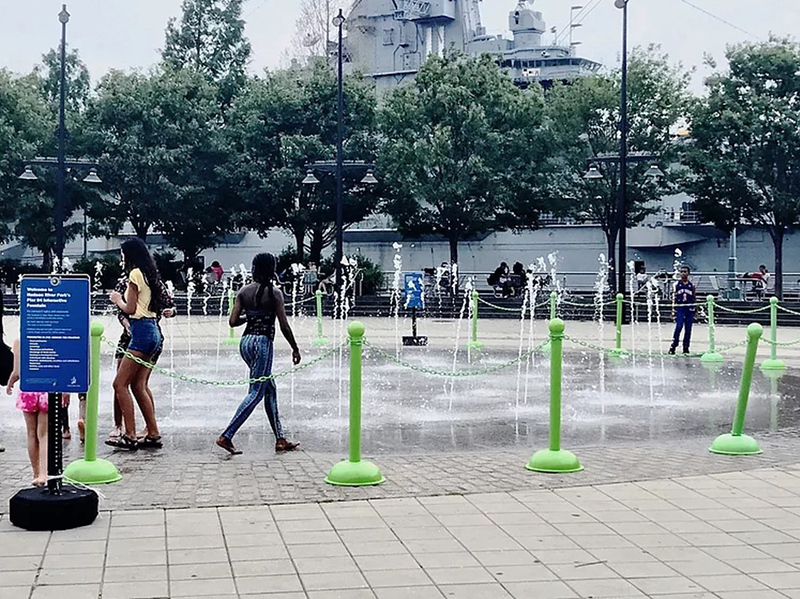 It’s playful and unexpected because the fountain is hidden below this man-made surface. And then there’s this cool and fun looking sports complex. In fact, I found several of these throughout the park. 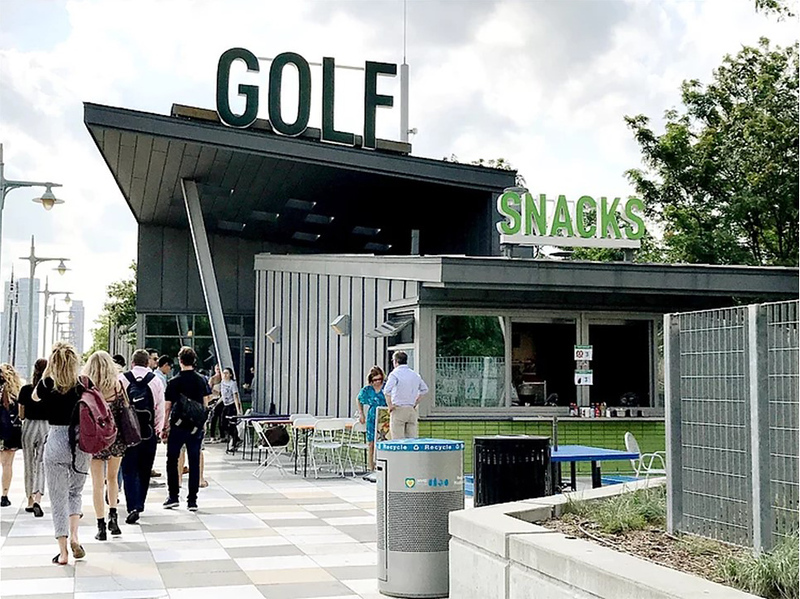 Golf and snacks, skating, paddling. Someone took a lot of care in designing these little buildings. They are playful and still utilitarian and provide an terrific hiding spot from sudden downpours and sun. 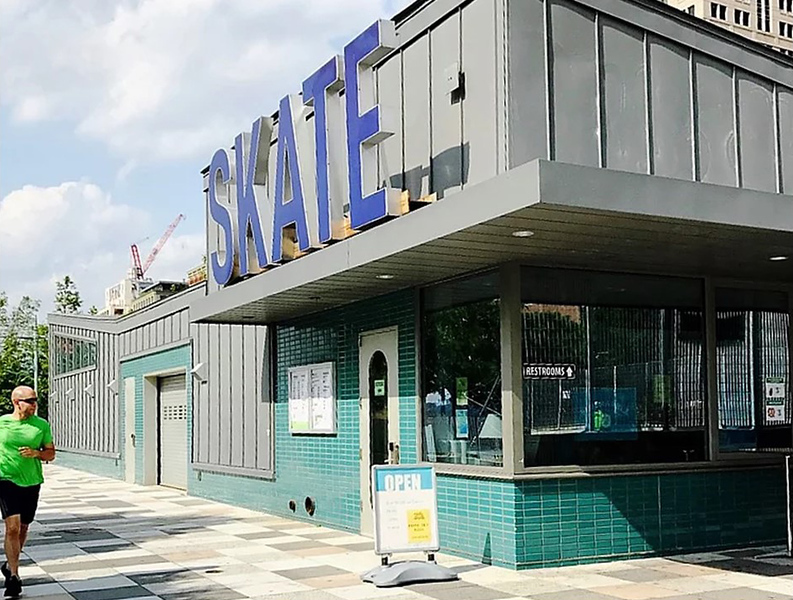 There is a designated facility just for skateboarding. And there’s even space for formal athletic instruction. These 4 year olds take their soccer training very seriously. Remember the earlier photo of the sidewalk that was divided into zones? Same idea here. The planters separate the main walking area from the programmed space. And notice how the field sits slightly lower than the main pathway shown on the left. Here’s another example of how the park is divided into zones. The obligatory playground with a splash zone and high tech climbing apparatus is tucked neatly into the landscape. It’s wrapped in a cool metal fence and softened with a very simple and beautiful curved planting bed. And the trees provide plenty of shade without the need for a fabric canopy. Novel idea isn’t it, trees for shade? But if you’re not looking to get your sweat on, the park is terrific for a cool walk or a quiet place to sit at one with nature. Pictured above is wide and comfortable walking path which is really a pier which stretches out into the water to give better access to the water. The curved planter edge is a nice contrast to the straight lines of the pavement and the pretty landscaping adds life and movement to this long stretch of pavement. We love to people watch. It’s so much a part of our culture. Why not formalize it with this terraced lawn? Enjoy views of the water, the sun on your face and terrific people watching. I chose this photo because I like how the variation of materials and heights create different activity zones. I also like how the giant boat cleats were incorporated into the design. Its a cool reminder of the park’s history. And if you’re a traditionalist, you might choose this park bench instead. Not into the modern lines of the structured terraced lawn for perching? Try this lawn which gently slopes up. In this photo the two adjacent spaces are quite distinct. 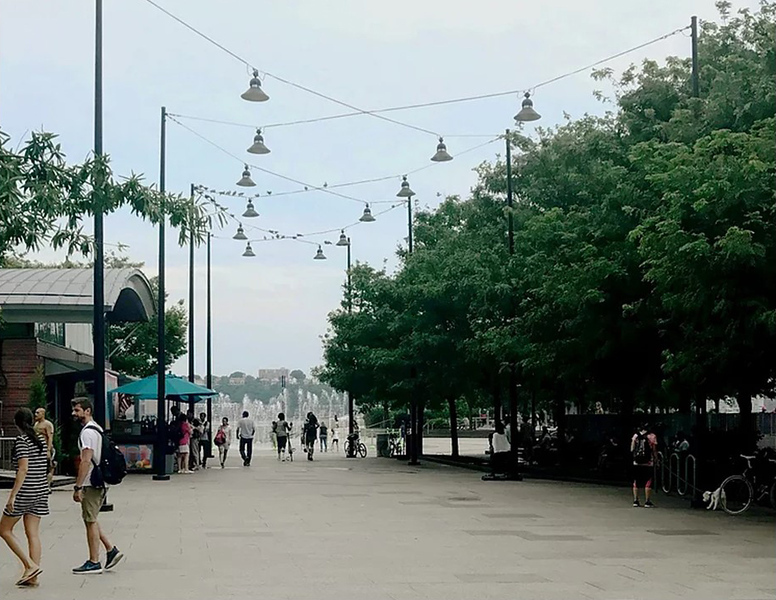 One functions as a plaza which connects to the pier in the background of the photo and the other leads to the programmed spaces. The trick is the differing paving colors and patterns that visually delineate the space. It’s so simple and very effective. The furnishings in the space add further definition with two bollards and trash bin on one side and a bicycle rack on the other. Both sides are anchored by a lush and colorful planter with trees and bushes. The single tree in the tree grate is like a book end holding the space in place. Collectively these elements create a richly layered space that is really easy to understand. 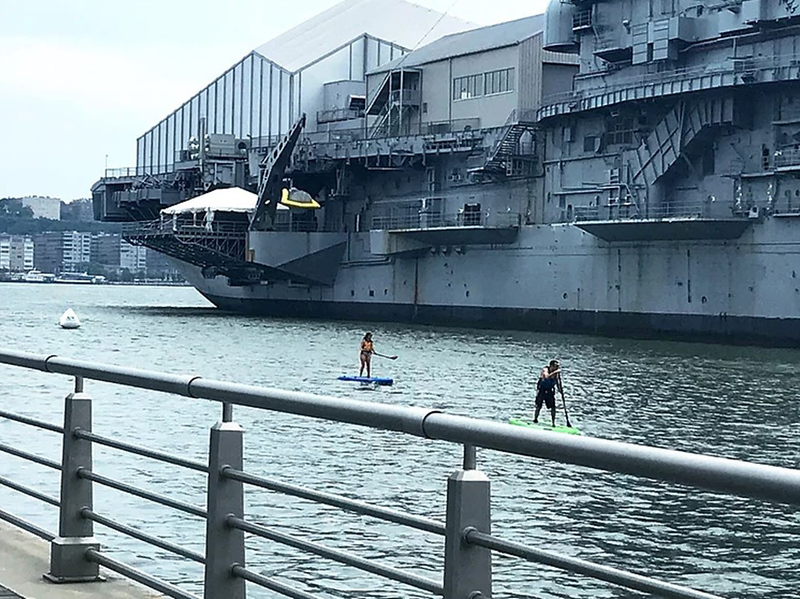 Still no Brad Pitt sightings, but I did spot these stand up paddle boarders alongside a historic vessel as part of the Intrepid Museum. 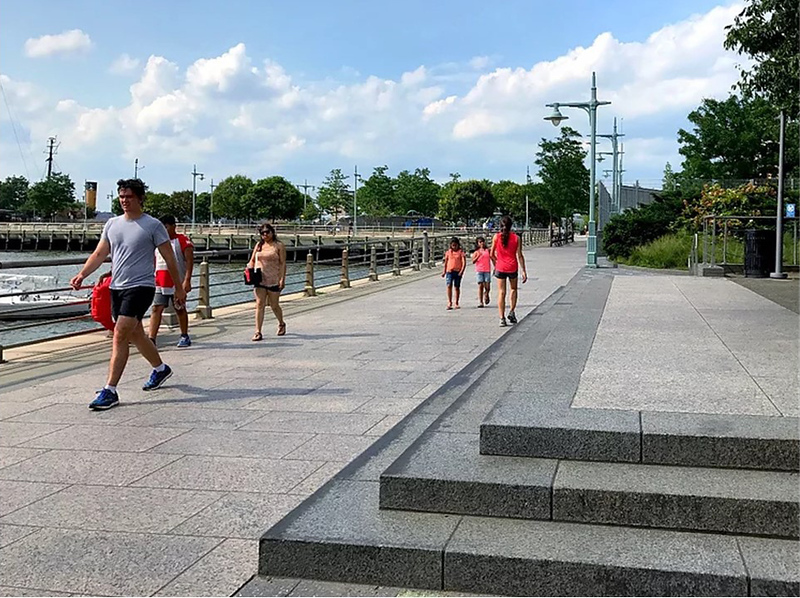 In Hudson River Park, every single space is usable and open to the public. Here people can actually experience the water. What Can Miami Learn from This? Great parks have a variety of well planned and well marked spaces. They are easy to navigate and easy to access. Think zones! And most importantly, they have a managing entity to plan, design, construct, manage and operate the park. In New York, where living space is limited, the parks become an extension of the home. I think this is true for most parks and especially in Miami where outdoor living is year round. 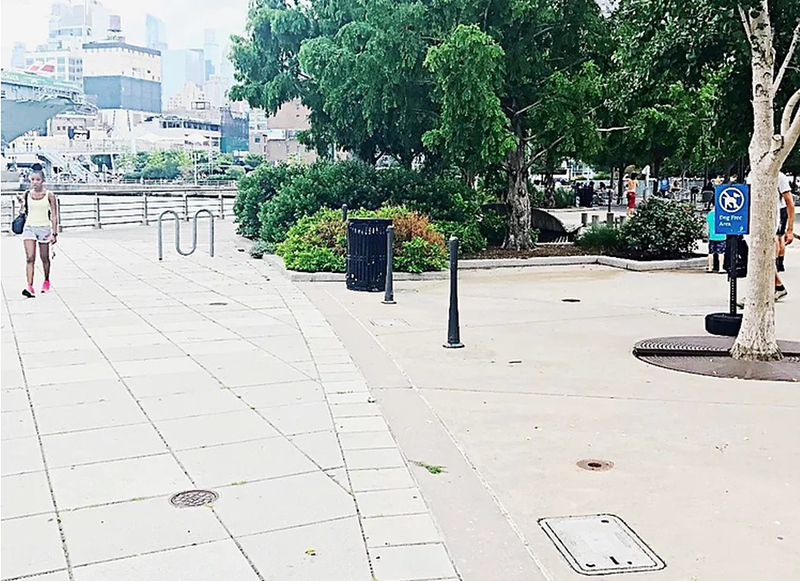 Imagine a downtown Miami waterfront with even half of what New York’s Hudson River Park has. Stay tuned!